Ok, Ok, I know – everyone read this book in 4th grade, besides me. But, I have to say, working my way through this delightful series, is perhaps even more meaningful as an adult, minded as I am towards real food, traditional ways of cooking, and family values of love, respect, and faith. They resound in abundance in the Little House series! *I look forward to reading a biography of Laura Ingalls Wilder, which is on its way to me via the library reservation system. 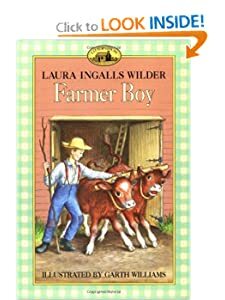 Farmer Boy chronicles a year in the young life of Almanzo Wilder and his family (Almanzo, destined to become Laura’s husband later in life). Growing up in a farm in upper New York State, not too terribly far from New York City, but far enough that their life is truly rural, Almanzo develops a love of farming and animal husbandry early in life. This leads to, for me, the part of the book that truly made me think and reflect (as enjoyable as the whole of the book was). For a minute Almanzo wondered if Mother was going to cry. It strikes me that this idyllic vision of farming doesn’t exist, except for a select few, in our day and age. I don’t personally know anyone that raises sheep, shears them, and spins their wool into yarn then weaves it into cloth on a loom, like Mother, from start to finish. Nor do I know anyone that has a small and diversified far, like the Wilder’s had, with cows and grains and vegetables and maple trees for sugar, and who heat their house solely with wood they chop. Hmm…as I’m writing all of that an thinking of all the hard, back-breaking work, maybe ‘idyllic’ is not the exact right word, but they truly were free, as Father said — free to prosper or fail, depending on the weather and their own work ethic. Some things have been lost since this series was written, but I truly believe that some things have flourished. What Father writes about farming could be re-written in a more inter-dependent style today. I am purchasing chickens, turkeys, and lamb from a farm in Western North Dakota. Beef from North-Western Minnesota. Honey from right here in the Fargo-Moorhead area. A 4-H hog from a family friend. (Also on the list to find? Rabbits and goats for meat). I shop at the farmer’s market and have a CSA, and, slowly but surely, I’m growing more and more veggies, fruits, and herbs, right on my own little patch of land. I can’t do it all, like the Wilder family seemed to, nor would I want to. I don’t think that is the overall call we receive from God, to be quite at the point of it. We should all help each other, using the gifts we were given, to give proper reverence to each other, and the world He created. I will be said when I finish the last 3 books of this series, as Laura, Mary, Carrie, Grace, Ma, Pa, ‘Manzo and Royal seem to be friends (and who could forget Mr. Edwards, Nellie, and some of the other memorable characters). I simultaneously long for the simple hardworking times described, and am grateful that the burden of producing food for my family can be shared with other families. What a treasure these books are! This entry was tagged book review, little house on the prairie series, traditional food.